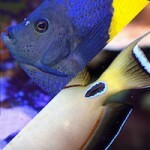 Color aberrations are a relatively common sight among surgeonfishes and tangs. 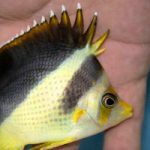 The Scopas Tang (Zebrasoma scopas) seems especially prone to this phenomenon, often appearing in piebald patterns of yellow, white and brown. 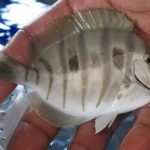 This also pops up now and then with some of the Ctenochaetus bristletooths and the Mimic Surgeonfish (Acanthurus pyroferus), but there seem to be relatively few records of these sorts of anomalies among the larger Acanthurusspecies. 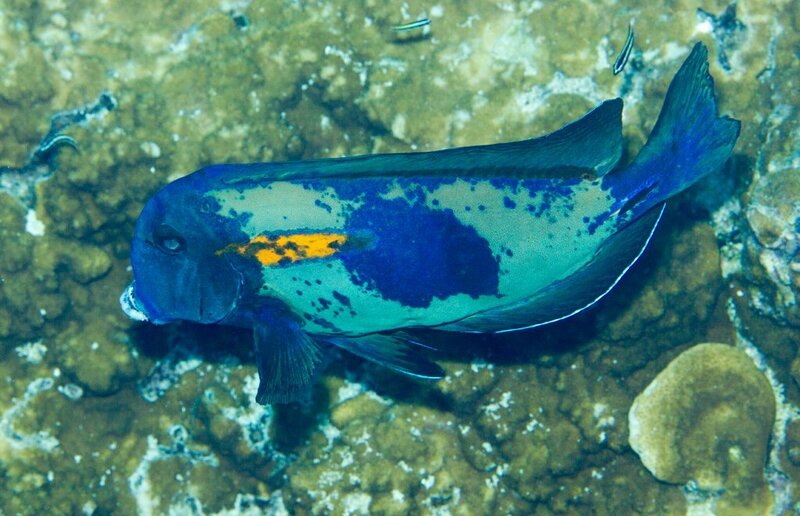 The photo seen here was taken in the Maldives and illustrates a highly xanthic variation of the common Blackstreak Surgeonfish (Acanthurus nigricauda). It’s easily identified by the pointed streak extending forward from the caudal spine and the deeply lunate caudal fin, and it’s interesting to see it here in such a depigmented state. 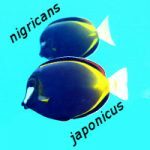 It raises the question of whether similar markings found in some of its close relatives have a similar underlying pattern, for instance, the epaulette of the Lieutenant Surgeonfish (A. tennentii) or the weird horseshoe of Fowler’s Surgeonfish (A. fowleri). 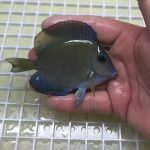 These large, detritivorous Acanthurus comprise a single diverse lineage whose members are rarely found with such prominent color aberrations. 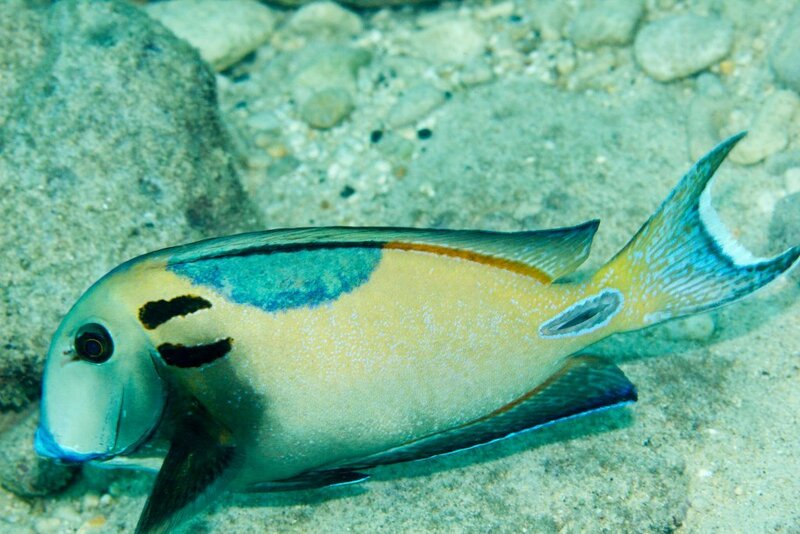 Another interesting example can be seen with this peculiar Orange-shoulder Surgeonfish (A. olivaceus) that was observed at Christmas Island in the Eastern Indian Ocean. 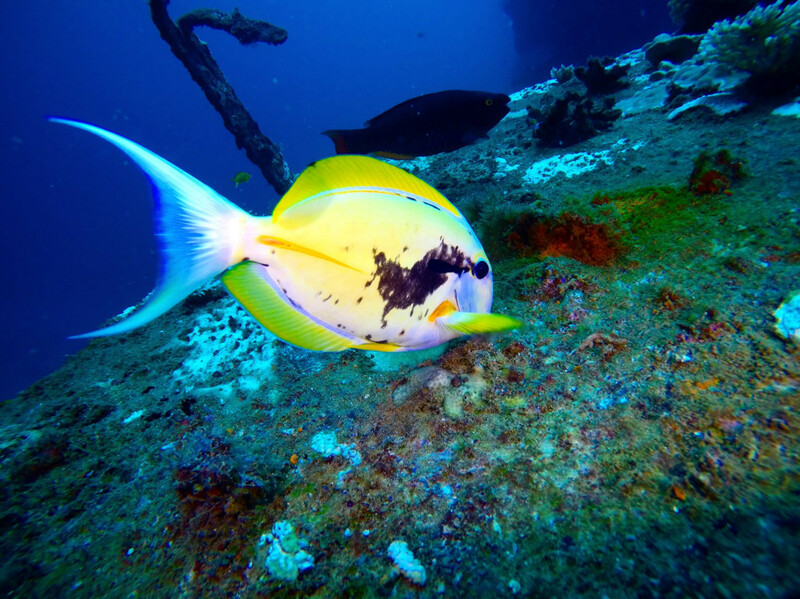 This location sits in a biogeographic “suture zone”, where we see interbreeding between the Indian Ocean and Pacific Ocean faunae, so it’s possible that the unusual markings of this specimen are a genetic accident caused by this. More traditional hybrids of this species and its geminate sister, A. tennentii, have also been well-documented here.